On January 11, 2016 the Turkish organisation Academics for Peace published a petition calling for an end to curfews and military operations in the Kurdish region of Turkey, which had reportedly resulted in a number of deaths and numerous hardships for the local population, including shortages of electricity, water, food and medicine. The petition was signed by more than 1,100 Turkish academics, as well as hundreds of international scholars. The government's reaction was swift. Within days President Recep Tayip Erdogan made a speech in which he compared the signatories to terrorists, public prosecutors began investigating academics that work at public universities, and a number of academics who had signed the petition were arrested. According to Academics for Peace, more than 500 of the signatories have been fired, or forced into retirement and four of them were detained for weeks. Academics for Peace now reports that the conflict has entered a new phase and the signatories to the petition being charged on an individual basis for "propagandizing for terror" (AntiTerror Law, Article 7/2). The public prosecutor is asking for prison terms of up to 7 and 1/2 years. The first court hearings begin on December 5, 2017 in İstanbul Çağlayan Justice Palace. 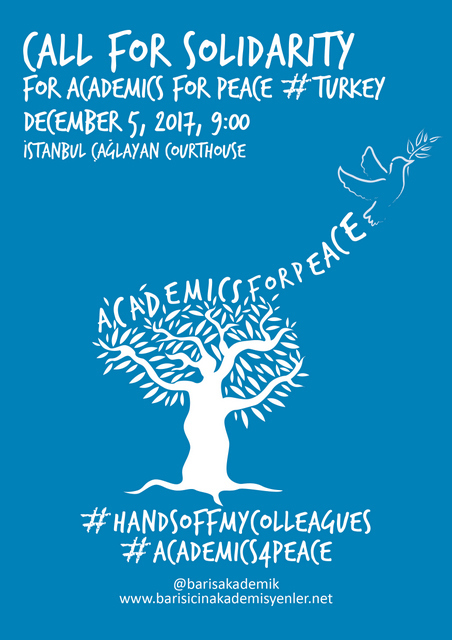 On 22 November, 2017 Academics for Peace issued a call for solidarity, which IAMCR is distributing to its membership. Read it here. IAMCR has issued previously various statements about the situation in Turkey and continues to monitor the situation and to encourage its members to express their solidarity with our Turkish colleagues.